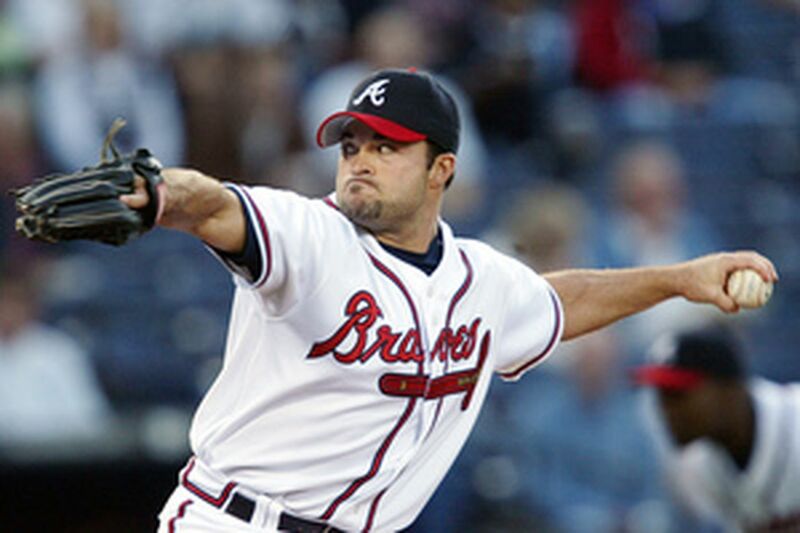 Braves lefthander Mike Hampton, who signed a $121 million deal, will miss his second straight season because of injury. Back in the second week of December 2000, baseball held its annual winter meetings and Alex Rodriguez and Mike Hampton both made big news. Rodriguez, the most ballyhooed free agent to ever hit the market, signed an industry-rattling 10-year, $252 million contract with the Texas Rangers. Hampton received what was then the richest contract ever given to a pitcher when he signed an eight-year, $121 million deal with the Colorado Rockies. Fast-forward to the second week of the 2007 season and Rodriguez and Hampton were both in the news again. While Rodriguez received big headlines for his torrid start to the season, Hampton was reduced to a paragraph or two. While Rodriguez was hitting home runs in four straight games for the New York Yankees, Hampton was learning that he will miss a second straight season with the Atlanta Braves because of elbow problems. The lefthander had surgery Tuesday to repair a torn flexor tendon in his elbow. It is not the most dreaded elbow injury a pitcher can have. No. Hampton had that baby, the torn ulnar collateral ligament, which requires reconstructive Tommy John surgery, in September 2005. He missed all of last season while rehabilitating. This latest injury will require about nine months' recovery time, meaning Hampton won't be the X-factor everyone thought he'd be behind John Smoltz and Tim Hudson in the Braves' rotation this season. Manager Bobby Cox had been banking on Hampton for 15 wins. Now, he will have to find them elsewhere, but knowing Cox, and the Braves, he will. The Braves are off to a hot start and have rotation depth with Chuck James, Mark Redman, Lance Cormier and Kyle Davies. After struggling in Colorado, Hampton had his original contract with Colorado divvied up among the Rockies, Marlins and Braves. The Braves are paying all of his $14.5 million salary this season, but much of that will be covered by insurance. Hampton will make $15 million next season, when he hopes to come back and give the Braves their money's worth in the final season of his contract. Like Hampton, Rodriguez has long since moved on from the team with which he originally signed his historic deal. The Rangers swallowed a good chunk of A-Rod's salary and sent him to the Yankees before the 2004 season. Technically, Rodriguez has three seasons remaining on his contract after this one. However, he has an opt-out clause in his contract that allows him to walk away after this season. Many baseball observers believe that Rodriguez will do just that, even if it means leaving $81 million on the table. Rodriguez will be just 32 when/if he hits the free-agent market, and he could have 500 homers (with a realistic shot at 700-plus in his career) by then. J.D. Drew walked away from the Dodgers and three years and $33 million over the winter and landed a five-year, $70 million deal with Boston. Drew and Rodriguez are both clients of agent Scott Boras, who knows all the angles. Players in the final year of a contract are often said to be in a "walk year" or a "salary drive" season. A walk year can serve as a great motivator for a player to go on a tear. Rodriguez is playing like a man gearing up for free agency. In his first eight games, he had 10 extra-base hits, including six homers, and 16 RBIs. "Right now," manager Joe Torre told reporters, "he's fun for me to watch." What a contrast that statement is to the one Torre made in October, when he dropped a struggling A-Rod to eighth in the batting order for a playoff game against Detroit. After a rigorous off-season training program, Rodriguez looks leaner this season and that has some believing he could be angling for a return to shortstop if he leaves New York after this season. Why would A-Rod want to leave America's baseball capital? Because he's never really gotten the love he craves there. He's always been compared to the franchise's leader, shortstop Derek Jeter. Jeter has four World Series rings. Rodriguez has had four brilliant seasons, and he's won an American League most valuable player award in New York, but he struggled in the postseason, and that's when stars are made in New York. Like all fans, Yankees followers are interested in what a player has done for them lately. They were down on A-Rod last fall, but they love him now. They enticed him into a curtain call after a game-winning grand slam last Sunday. But A-Rod will not gain the total acceptance of Yankees fans until he shines in the postseason. Right now, he's playing like a guy intent on getting there. That's more than can be said for Hampton. He's done for the season. Again. Alex Rodriguez and Mike Hampton. Two big newsmakers in the second week of December 2000 making news again - for different reasons - in the second week of the 2007 season.